At the second Quarterly Breakfast of 2013, the Venturi Brighter Day Employee Fund awarded two grants. 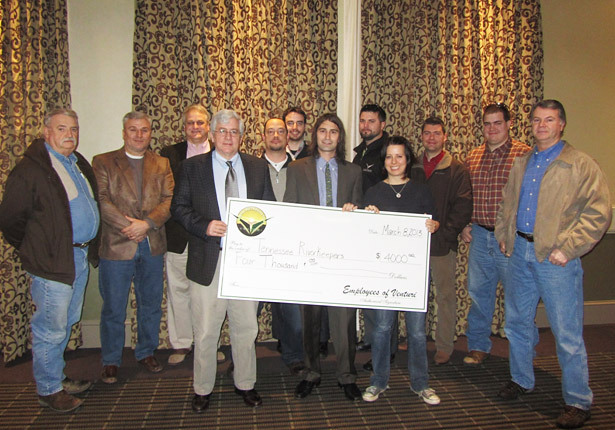 The recipients of this quarter’s grants were Tennessee Riverkeepers and Still Serving Veterans. The mission of Tennessee Riverkeepers is to protect the Tennessee River and its tributaries by enforcing environmental laws and educating the public to help ensure the Tennessee Valley has a safe, clean water supply. Tennessee Riverkeepers monitors polluters and their pollution permits, responds to citizen complaints, and utilizes other methods to further protect the Tennessee River and its tributaries. They will use this grant for equipment repairs and water quality monitoring supplies. Attending Venturi fishermen present Tennessee River Keepers with a $4,000.00 check from the employee Brighter Day Fund. Still Serving Veterans, founded in Huntsville, AL, strives to empower Veterans and their families to transition into post-military lives. This organization assists Veterans with workforce development, obtaining all VA benefits and services, and with establishing connections to existing local, state, and national resources. Still Serving Veterans will use this grant to help fund the Veteran’s Workforce Investment Program. This program is designed to utilize virtual technology and human touch to facilitate career transition into the civilian workforce. 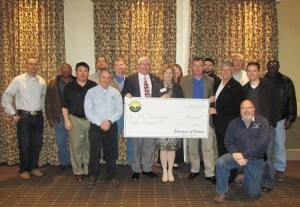 Attending Venturi Veterans present Still Serving Veterans with a $5,000.00 check from the employee Brighter Day Fund.